Just one study conducted in Brazil on ‘glyphosate-resistant’ soybeans has shown some reprehensible results from utilizing Monsanto’s favorite venom. 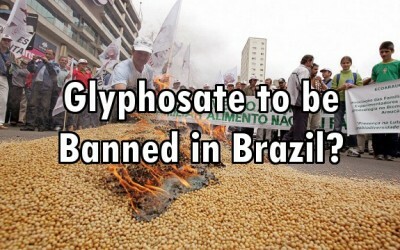 Brazil is currently the second largest producer of soybeans in the world, and sadly, they are almost entirely now GMO. More than 70% of soybeans cultivated in the country are from GE glyphosate-tolerant seed. A mere five states are responsible for 80% of Brazil’s soybean production; Rio Grande do Sul and Parana in the south, and Mato Grosso, Goîas, and Mato Grosso do Sul in the center-west region. The Federal Prosecutor has asked for all glyphosate herbicide use to be suspended due to questions about its chemical makeup. The Prosecutor is calling into question 2,4-D as well as the active ingredients methyl parathion, lactofem, phorate, carbofuran, abamectin, tiram, and paraquat. Why? The inactive ingredients can be just as, if not more toxic. A study published in Pesticide Biochemistry and Physiology entitled, “The effect of metabolites and impurities of glyphosate on human erythrocytes (in vitro),” explains just how RoundUp chemicals are invading our human blood. The actions also request that the Ministry of Agriculture as well as Livestock and Supply (MAPA) suspend the registration of glyphosate products until a conclusion about their safety is reached by ANVISA. The civil lawsuit contesting the registration of the herbicide also asks that the National Biosafety Technical Commission (CTNBio) restrict the commercialization of the transgenic, GMO seed. Just last week, the Federal Appeals Court in Brazil unanimously decided to cancel Bayer’s Liberty Link GM Maize. Thanks to the BRICs nations, biotech just might get a run for their money and have to stop poisoning the world. LOL! 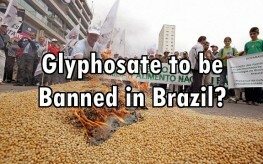 Brazil should worry about how they’ll stop their PEOPLE from killing each other before they worry about RoundUp. They’re like the Chicago of South America. Global March Against Monsanto! – Saturday, May 24, 2014. Google it to find the event nearest you and join millions worldwide marching to take back our food!